BE AWARE OF THE DANGERS AND RISKS OF AN OPEN VERTICAL EXHAUST STACK. Income loss due to equipment down time. Today's more efficient engines are also more complex and costly to repair. The installation or Weathercaps on all your trucks, off-road and service equipment with vertical exhaust stacks protects tham at a fraction of the cost of unwanted repairs. Available in over twenty sizes in various finishes. An exclusive Lock-Bar security option is available on select models. There is an engineered Weathercap® size for each stack diameter. Over 20 different sizes to choose from. 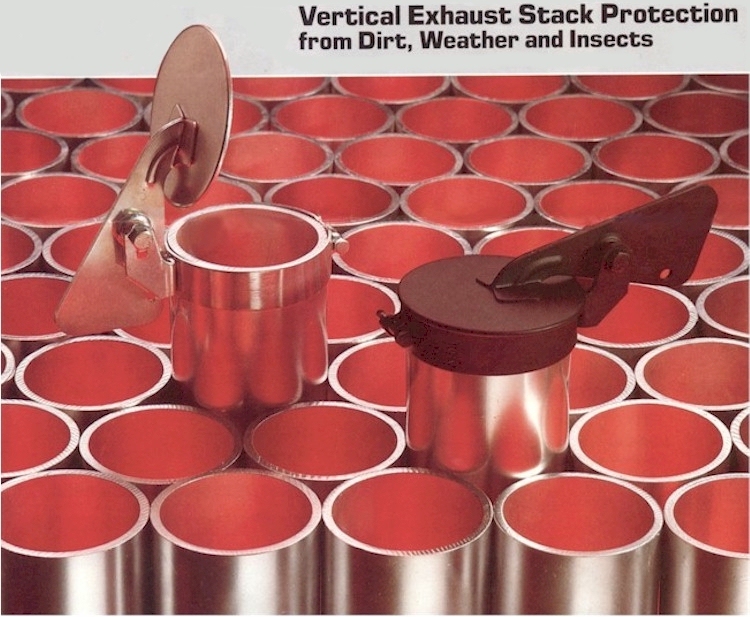 Fit vertical exhaust stacks from 1" to 7-15/16" O.D. Easy installation. simple position and tighten one bolt. No holes to drill. No clamps needed. Weathercap's proven design opens to full vertical position. The slightest pressuree inside the stack operates Weathercap® so engine breathes freely. Closes instantly when exhaust pressure stops. Proper counter-balancing and hinge point, allow Weathercap® to close tightly even in abnormal parking angles. Tin cans or other temporary devices do not provide adequate protection for expensive equipment. Weathercap® protection is a minimal expense for preventive maintenance compared to costly equipment down time. Weathercap® virtually eliminates intake of dirt, dust, debris, snow and rain blowing or falling into the exposed stack pipe. Reduces the threat of engine damage. Maximum protection for trucks, farm and off-road vehicles, and equipment with vertical exhaust stack systems. Finishes available: satin aluminum and black high heat enamel, chrome, and silver metallic powder coating. Powdered coated finish available in other colors as special order. Note: Mounting band adjusts for differences of 3/32" over or under stack size.